Screenwriter-turned-novelist Steve Bloom discusses films and dramatic structure. Steve Bloom, screenwriter-turned-novelist, talked about his days writing for Hollywood studios, fighting to get credit for a film (“You live and die by your credits.”), working with actors (“They’re all maniacs! They want to be in every scene.”) and his transition to writing his first novel, the young adult book, The Stand-In. He was the third of four presenters in the 2016-17 Writers’ Workshop Series. Bloom said he got the idea for The Stand-In 10 years ago at a soccer game, when the father of one of his daughters’ friends lamented that the girl was stood up for a prom date after she had already bought her fancy dress. Bloom worked the idea into a script about a cash-strapped high school senior who needs money for tutoring to raise his SAT scores so he can get into the college of his dreams, Columbia University. The character ends up hiring himself out to wealthy parents whose daughters need dates for social events. After shopping the script around to studios and getting no nibbles, Bloom decided to turn the screenplay into a book. Ironically, once he found a publisher, a studio came knocking, and he was hired to transform his novel into a screenplay. He found that, in the act of writing the novel, he got to know his characters more deeply, making for a more robust screenplay than he had at the outset. 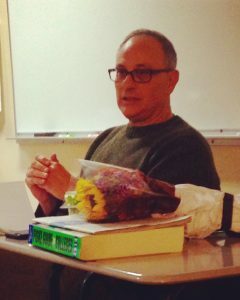 Students in Lori Pelliccia’s honors-level Writers’ Workshop class and in Andrew Shelffo’s English class attended the public forum, and asked questions about Bloom’s writing process and his stint in film school at the University of Southern California. He quit law school to follow his dream, but never saw it as an artistic imperative, he said, more like a way to make a living. “I hated law school. And I knew the vocabulary of film,” he said, describing a particular love for classic movies of the 1930s. This was the 1970s, after all, when films like The Godfather, Star Wars, and Five Easy Pieces were just starting to turn filmmakers into household names. Bloom’s first hit was 1985’s The Sure Thing, a “John-Hughes-esque” road movie about a young man, played by John Cusack, who travels across the country for a romantic hook up, only to be trapped with a former crush that he eventually falls for. Bloom said the set up provided a “unity of opposites,” an ideal environment for drama, which is composed of conflict, to thrive. He went on to write scripts for Tall Tales, Jack Frost, and James and The Giant Peach. He told students today’s opportunities for screenwriters are in television, where fully developed characters and story arcs outclass the mainstream Hollywood blockbusters coming out of major studios. Bloom followed the presentation with a master class for students in the Writers’ Workshop class. The final Writers’ Workshop presenter will be Random House editor Andy Ward, whose booklist includes the bestsellers When Breath Becomes Air by Paul Kalanithi and Lena Dunham’s Not That Kind of Girl.